In the summer, due to the sweating of the body and the extreme heat, consuming cool and hearty Syrups makes the body relax. If the Syrup is in addition to its pleasant taste and aroma, it is recommended to use it more. When we get tired and cramped from the outside, only a cool Syrup can make your body and soul refreshing.It’s better to get this freshness ;Do not go for caffeinated and carbonated Syrup And use home-made and high-quality Syrups instead of carbonated beverages. 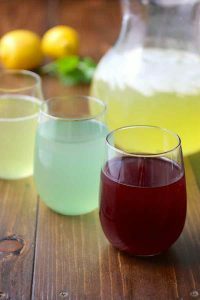 Be assured that home-made Syrups also bring joy to the soul and body ; It also provides nutrients and vitamins and health benefits to the body. Here we want to introduce a variety of persian syrups ,And examine their properties. The use of this syrup in Iranian homes has been commonplace since the past. Cranberry rich in vitamins B and C and rich in mineral salts Sodium, magnesium, potassium, copper and zinc And it has a small amount of vitamin A .
Cherry Fruit blossoms help relax the nerves and eliminate thirst And the appetizer is good. 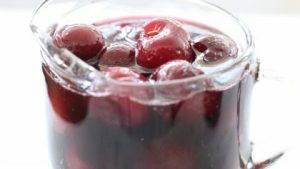 Consumption of several consecutive days of cherry syrup is very effective in treating the liver, kidney, stomach and intestine. This syrup is made from Lemon. Lemon has vitamins A, B1, B2, B3 and C.
The presence of vitamin A has a great influence on the growth and maintenance of skin cells. Lemon syrup also very effective for those with bleeding. You must first mix the lemon with sugarand water . The vitamin C contained in the lemon causes the body’s vitality, and has a great impact on the internal glands of the body. Lemon also eliminates nausea. You can make a Bid meshk syrup using Bid meshk extract, juice and sugar; you can also add saffron and rose water to improve its flavor. Bid meshk A plant is a laxative and a heart-nervous enhancer that stimulates the sweat of the digestive system and increases appetite. It also strengthens the nervous system, relaxes and sleeps. In addition, it reduces the temperature of the body and the heat, and it also has a curative effect. Iranian syrups have a lot of flavor and good taste, and can be put at the lowest cost in the family’s nutrition basket. From the disadvantages of carbonated beverages and sweet drinks, these days in the cyberspace, many information is redistributed among users. Meanwhile, traditional Iranian beverages, besides having a lot of benefits for the body, can prevent the harm of carbonated beverages and mills. In the health package today, you will find some of these useful drinks that can be found on Iranian tablecloths, just try them once. Khak_e_shir has fatty acids that heal wounds and injuries; it is also an appetite and invulnerable eardrum, and it is also very useful for relieving inflammation of the skin like hives. Most importantly, it is cabbage and it reduces body heat. It also has an anti-dandruff effect and is very useful for bowel discomfort, such as diarrhea and constipation. This syrup is one of the most delicious and popular drinks for Iranian people. This syrup is made from a mixture of sugar, white vinegar, peppermint or peppermint extract and water. One of the best drinks for thirst and heat dissipation. You can use apple vinegar to make it instead of white vinegar. Peppermint contains protein, fat, carbohydrates and water. This plant reduces anxiety and worries, eliminates nausea, has a disinfectant and has a muscle relaxant. In addition to this peppermint, it prevents sleepiness and relaxation of the nerves.Vinegar also has antibiotic, anti-inflammatory, anti-bacterial and fungal properties and also reduces blood pressure, helps to improve food poisoning and digestive disorders, and improves the body’s immune system against pathogens. Because mint and peppermint are slightly hot. Some add cucumber water to this syrupbecause the cucumbers are cool. So it cools the body. It also helps digest food, it is laxative and urinogenic. It also purifies the blood and relieves thirst. To increase the body’s resistance to infections and to treat common colds. We first cut the rose petals, then boil the water in a kettle or pot. Pour petals into a pot and pour boiling water on petals at once, to cover the boiling water on the petals. And in the pot, we wait for 24 hours, it does not leave the scent of flowers. Now, after 24 hours, let’s paint the petals and just let the water out and never squeeze with the hand, because it will stain the syrup badly. Now get the sugar in the water and place it on the heat to make the syrup and . رستوران ایرانی پرشین رز در سیدنی با افتخار آماده پذیرایی از مهمانان گرامی می باشد. شما مشتریان گرامی می توانید جهت رزرو و دریافت اطلاعات بیشتر با یکی از شماره های زیر تماس حاصل فرمایید. کلیه حقوق وبلاگ متعلق به persian restaurant می باشد.